50. 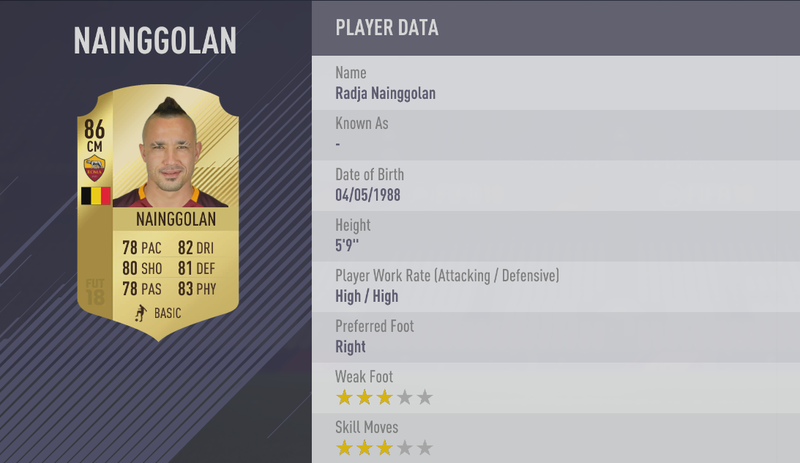 RADJA NAINGGOLAN 86 | Roma. One of the game's finest midfielders in the game. 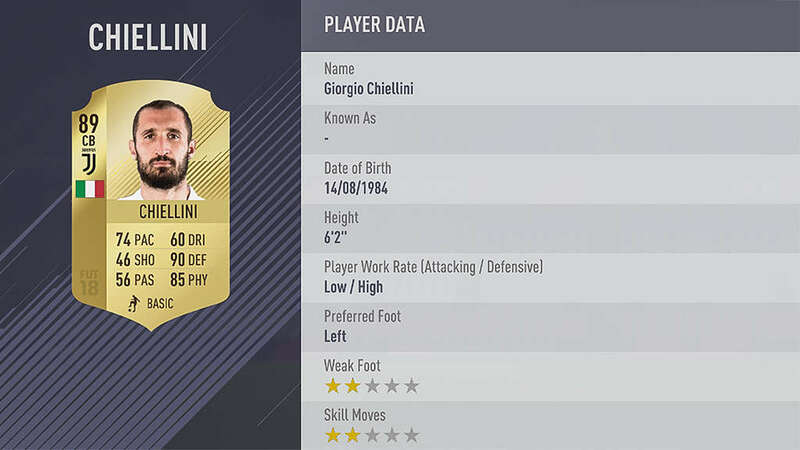 80 Shooting and 82 Dribbling mean he can push towards goal, while 81 Defense and 83 Physical with overall rating of 86.
the foward was in brilliant form last season and helped napoli fish 3rd with his scoreing ability. 90 Pace and 89 Dribbling with Shooting ability of 82 and overall rating of 86. 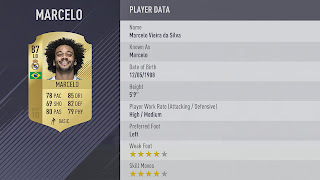 Manchester uniteds big money signing boosts a great potential of 84 Physical and 83 Pace with a shooting ability of 85 and overall rating of 86 two better than his previous 84 in fifa 17. Despite his inability to cement his place as a regular starter under Carlo Ancelotti he still made the top 50 players with overall rating of 86 one point lower than last edition. The Inter shot stopper still remains one of the goal keepers in the game with 87 Reflexes, 87 Diving, and 87 Positioning retaining his 87 overall rating. The midfield magician with 90 Dribbling and 87 Passing ratings despite dropping from his previous position still remains one of the games finest with overall rating of 87. A great mid field talent with superb 84 shooting ability to score and 86 passing. despite his poor third season at Barcelona yet retained his 87 rating. Vidal keeps his 87 rating intact from FIFA 17 most effective in a defensive midfield role. 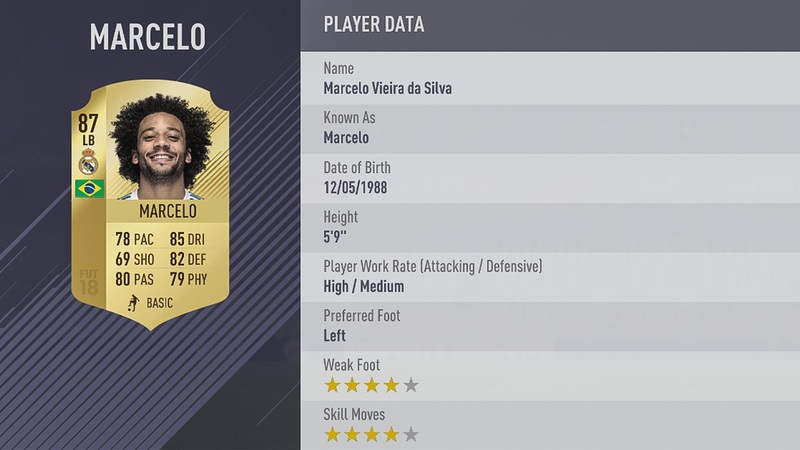 the highest-rated left-back in the world on FIFA 18.with his 82 Defending rating, but he can also fly up the pitch and create chances with his 85 Dribbling and 80 Passing. 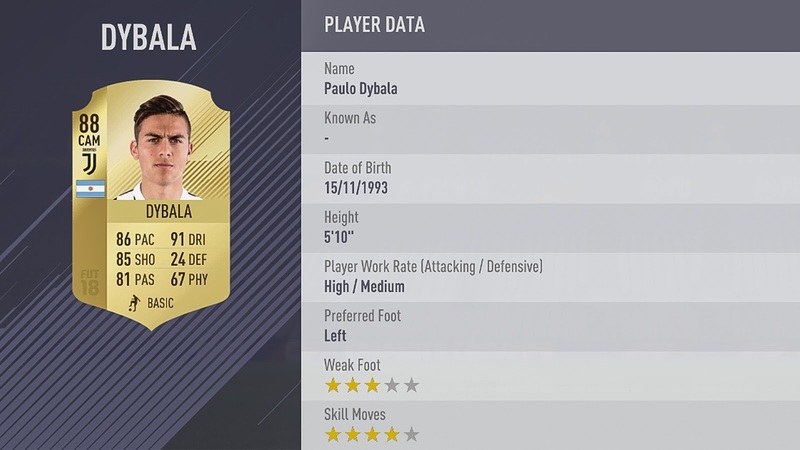 his 88 Strength and 84 Dribbling. When tasked with more attacking roles, Pogba can use his 84 Passing and 79 Shooting and overall rating of 87. Had a rapid rising from initial 81 to previous 83 now 87. Played a vital role for both Leicester and Chelsea title winning campaign. a great play maker with 89 dribbling ability and overall rating of 87 very creative and strong. Arguable the best playmaker in Epl with 87 Passing and crossing—especially with his left foot most often utilized as a central attacking midfielder. Oblak’s 90 Handling and his 87 Positioning made him a world class shot stopper behind just few in his position. With 88 Shooting score and his skills as a striker are supplemented by his 82 Dribbling and 82 Physical made him one of the elites in the game. A true leader in the defencive catel of any team. A strong figure in the heart of defense. upgraded by one point from his previous 87. Despite his age the Dutch man still remains one of the fastest wingers with 86 Pace combined with 90 dribbling ability and 86 shooting. Always comfortable when with the ball and knows what to do at the right time using his brilliant and creative 90 Dribbling ability. A great talent with his 91 dribbling, 86 pace and 85 shooting makes him suitable as playmaker or attacker. Surprisingly missed out of the top 10 but still remains a fierce attacker. His 86 Pace and 87 Dribbling makes him one of the best. One of the best goalkeepers in the premier league, helped chelsea to win the title with his numerous clean sheets. A great treat to any defense, he still maintained his rating in FIFA 17.
dropped one point after series on injury but still remains one of the fastest players in the game with 94 pace, 86 Dribbling and 87 Shooting. Always solid in defense, his 90 defense made him the highest in the game. An all-round round payer makes use of his 88 Passing and 85 Dribbling to create chance for his team mates to score. The want away Arsenal man got a one point boost from his previous 88. Sánchez uses the 89 Dribbling skills and 86 Pace to strike fear into the hearts of defenses. Boosted by one point from previous 88 in fifa 17. Just like wine, the Italian legend seems to get better with age. A midfield maestro, his 89 Dribbling and 86 Passing have put him among the top technical central midfielders in Europe. Missed out of the top 10 players but remains a top class shot stopper with incredible saves. Score 32 goals in his debut season for Juventus and has been upgraded by one point to 90. Remain instrumental to madrid's champions league success and one of the best passer of the game with 88 passing. The only Epl player in the top 10 of Fifa 18 rating, his upgrade from 89 to 90 made him take over from Zlatan Ibrahimovic as the Premier League best player. A mafia in defense rugged and aggressive overtakes Jerome Boateng to be named FIFA 18's best defender with overall rating of 90. 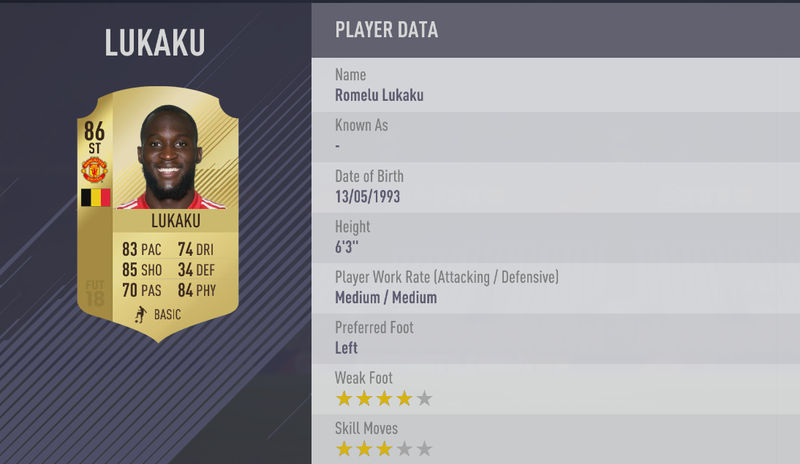 A born goal scorer, unstoppable in front of goal remains Fifa's second best center forward. Remains the best goalkeeper in the world, his 92 rating is still the highest of any goalkeeper with David De Gea his closest rival. The Barcelona man remains the best striker in fifa 18. Despite his controversial nature it's Suárez’s 90 shooting, 86 Dribbling and 81 Physical that truly sets him apart. The world most expensive player still maintained his 92 rating slightly below Messi and Ronaldo with 92 pace and 94 dribbling. A superb talent with his 95 dribbling power as the highest, combined with 89 Pace and 90 Shooting. Messi maintained his 83 rating one point behind only Ronaldo. 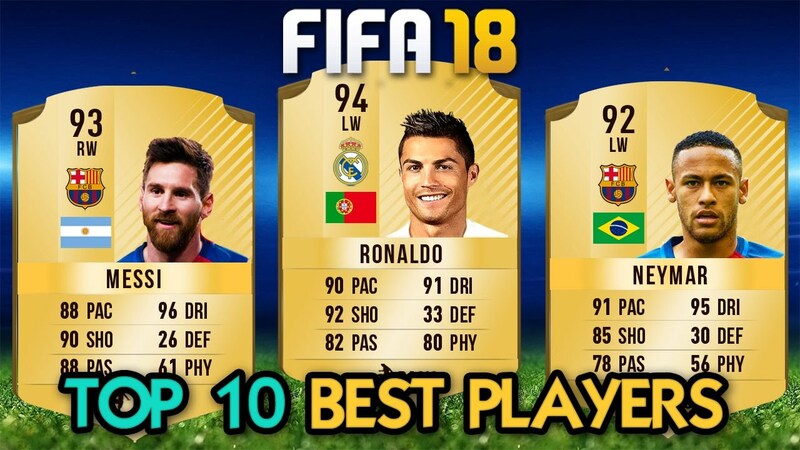 I'm not surprise to see Ronaldo as number 1 in this Fifa 18, retaining his orevious 94 rating in. with his 93 shooting power which made him a goal machine and 90 pace and dribbling made him unstoppable against any back line in the world.